This is your Donation message. 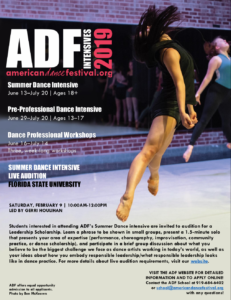 Students interested in attending American Dance Festival‘s Summer Dance intensive are invited to audition for a Leadership Scholarship. Learn a phrase to be shown in small groups, present a 1.5-minute solo that presents your area of expertise (performance, choreography, improvisation, community practice, or dance scholarship), and participate in a brief group discussion about what you believe to be the biggest challenge we face as dance artists working in today’s world, as well as your ideas about how you embody responsible leadership/what responsible leadership looks like in dance practice. For more details about live audition requirements, visit our website.